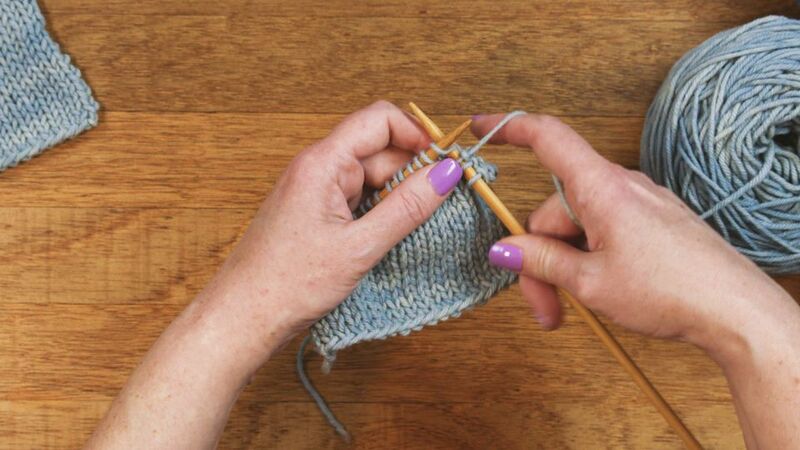 The knit stitch is the basis for all knitting and it is the first stitch everyone learns. Once you know how to cast on and knit, you can make the most basic projects like washcloths, scarves, even a basic afghan. When you have cast on the number of stitches required for your project, you are ready to begin knitting. And if you used the knitted cast on, you already know most of what you need to know about making the knit stitch. This tutorial shows how to make the knit stitch in what's known as the English style (sometimes also called American, throwing, or right-handed knitting), where the yarn is held in the right hand. Another option is the continental style, also known as German or picking, in which the yarn is held in the left hand. Hold the needle with the stitches on it in your left hand and the empty needle in your right hand. The working yarn should be held to the back of the work. The stitches are facing you, with the bumpy part of the loops facing in toward your body. Slip the tip of the right-hand needle into the first loop, from front to back. When you form your stitches, make sure you're working through the single loop that is hanging on the needle and not the bumpy part. Once the needle is in place, simply carry the working yarn -- holding it with your right hand -- over the right-hand needle, going counter-clockwise around the needle. Make sure the working yarn slides between the two needles. It is this yarn that makes the new loop that enables your knitting to become a full project. Sometimes it's difficult to come up with good names for things. I call this step 'turning the stitch,' but I don't know if there's a real name for it. What you're doing is sliding the right-hand needle from the back to the front of the other needle. You're basically punching through with the working yarn so that it makes a loop on the right-hand needle. Slide the right-hand needle down so that the loop gets close to the tip of the needle but doesn't slide off. When the tip of the needle gets close to the edge of the left-hand needle, give the right-hand needle a little push so it can move in front of the left-hand needle. That's the 'turn' I was talking about. When you get to this point, it all starts to make sense and looks like you're actually doing something. Congratulations! Once you are this far, finishing the knit stitch is easy. Slide the right-hand needle up so that the first loop on the left-hand needle slides off that needle. That stitch is now "worked." Now, move on to the next loop on the left-hand needle and do the exact same thing, repeating until you are out of stitches. You just knitted your first row! All you have to do is flip the work over. The side that you just had in front of you temporarily becomes the back. Move this needle from your right hand back to your left hand and you'll see you're right where you started the last row. Repeat all of the previous steps to continue to knit this row and the next and the next. Now you're really knitting. Knitting is a wonderful craft because you can make projects and useful things even while you're learning. This really does help keep you motivated and as you knit, you'll be thinking about all the cool stuff you can make next. Even if all you know is how to make a knit stitch (and how to cast on and bind off, of course) then you can make a project. Don't believe me? Try this. Grab a ball of medium weight yarn, or whatever kind of yarn you have lying around the house (it doesn't have to be a full ball). If it has a label, find the knitting needles closest to the size recommended on the label. If not, pick up a pair of needles somewhere in the range of size 6 to 8 US, or 4.5 to 5 mm. Knit every row until you basically have a square (it should be about six inches all around). Congratulations! You just made your very first knit project! And what can you do with it? Use it as a washcloth or a hot pad, or make a bunch of them and stitch them together into an afghan. This tiny project might not seem very impressive until you learn that this "pattern" (knit every row) is so popular it actually has a name: Garter Stitch. Now, whenever you see "Garter Stitch" in the title or instructions for a pattern, you know that's just a fancy way of saying knit every row. These patterns are often good for beginners because there's no real pattern to follow.